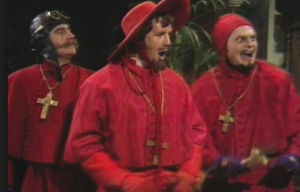 “NOBODY EXPECTS THE SPANISH INQUISITION” was a favourite line in Monty Python’s Flying Circus and I do hope nobody expects me to know much about said Inquisition. I do believe that Spaniards of Moorish and Jewish origin, many of whom had converted to Christianity under the influence of conscience or the threat of burning at the stake were visited, questioned, tortured, robbed and killed under the guise of protecting the Catholic Church. Such Spanish practices were abhorred by the Protestant English. “There can be no more signal proof of the earnestness with which the general public of London regard the danger of allowing Germans to be at large in our midst than the demonstration in Trafalgar Square on Saturday afternoon. It was the biggest crowd in the square since the outbreak of the war. It was also the most determined” THE THUNDERER enthused. London’s Lord Mayor sent a letter of support, Mr Rudyard Kipling and Mr Harry Lauder spoke in support of the resolution proposed by Sir Alexander Bannerman, demanding immediate internment of all aliens of enemy blood, whether in-naturalized or naturalized. The proposal was adopted with prolonged acclamations. On 16 July this week THE TIMES reported that 100 years before, to the day, the Royal Family had abandoned its German name and adopted the title THE HOUSE OF WINDSOR.